+1 this page, I can’t! 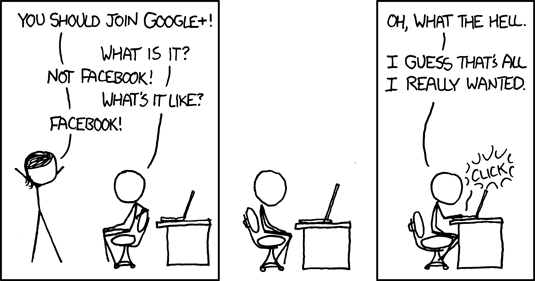 Google + Google Apps = -1 | A. P. Barratt - Professional Geek, Author of Evil Dr. Eye webcomic and The Hudud Trilogy, Front End Developer. So Google Plus has recently launched. This is basically Google’s take on Facebook, it’s designed from the foundations around the concept of privacy in a way that actually makes it part of its normal usage. No more worrying about statuses that you’d rather your parents not see. In similar fashion to Facebook’s Like buttons, +1 is the term for Google and I have conceded into adding a +1 button to my blog’s pages, you can see it at the top along with the equivalent Facebook and Twitter buttons. But in what way have I conceded? Well, as we’ve discussed before, I use Google Apps. This means that my domain name, andybarratt.co.uk has its MX records pointing at Google. So I have Gmail but my email address doesn’t end with gmail.com, it ends with andybarratt.co.uk. I also have my calendar and contacts on Google so by using this email address on my iPhone or on my Android phone, I have everything synced up (for free I might add, hint hint Apple). But here’s the thing, we can easily agree that Google Apps users are among the most loyal Google customers, many of us are in fact paying for the premium services that Google offers, yet Google never includes us in their beta tests. Surely loyal customers like us should be the first people to be included, not the last. I want very much to be able to use Google Plus but I can’t get near it, even if you invite me, I can not get in. Google promise to be bringing Apps users access soon and I suspect this is true but it’s easy to be wary. After all, Google Buzz was never offered to us in the end and the same promise was given there too. So I have a confession to make, yes, I have added a +1 button to these pages but, I have not tested it. For all I know, it simply does not work.